Bay window, Stanley Melbourne Bruce, buttress, Henrietta Cooper, Henrietta Cooper Music School, crenellation, education, four-centred arch, Gothic Revival, Launceston, Launceston Church Grammar School, music, Mowbray, parapet, pointed arch, school, Tas, Tasmania, tower, Tudor arch. 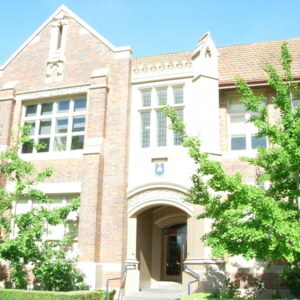 The Mowbray campus of the Launceston Church Grammar School in Launceston, Tasmanian, has a number of buildings of different eras with medieval features. 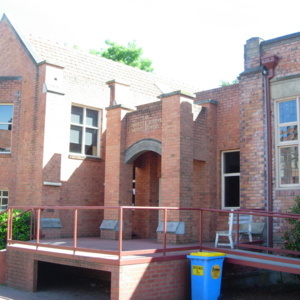 These include the administration building whose foundation stone was laid by Prime Minister Stanley Melbourne Bruce (1883-1967) in 1923, and the more recent Henrietta Cooper Music School and the small corner tower. All of these buildings feature buttresses and rounded Tudor, or four-centred, arch doorways, and the buttresses of the corner tower continue to form crenellation, whilst the corner buttress at the entrance to the administration building ends in a pointed arch. The music school also has a bay window, a common feature of Gothic Revival architecture. Bay window, buttress, crenellation, education, four-centred arch, Gothic Revival, Henrietta Cooper, Henrietta Cooper Music School, Launceston, Launceston Church Grammar School, Mowbray, music, parapet, pointed arch, school, Stanley Melbourne Bruce, Tas, Tasmania, tower, Tudor arch. 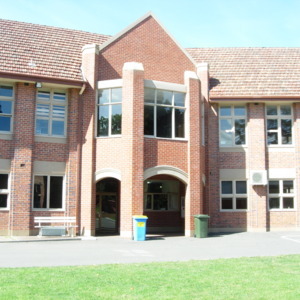 “Launceston Church Grammar School, Mowbray Campus, Tasmania,” Medievalism in Australian Cultural Memory, accessed April 25, 2019, http://ausmed.arts.uwa.edu.au/items/show/1256.